As you already know if you have read this or this, I’m a big fan of PSScriptAnalyzer to maintain a certain coding standard. This is especially powerful inside a release pipeline because this allows us to enforce that coding standard. In our CI pipeline, we can easily make the build fail if our code violates PSScriptAnalyzer rule(s). How can we make our CI tool publish PSScriptAnalyzer results with the information we need to remediate any violation ? All CI tools have ways to publish test results to make them highly visible, to drill down into a test failure and do some reporting. 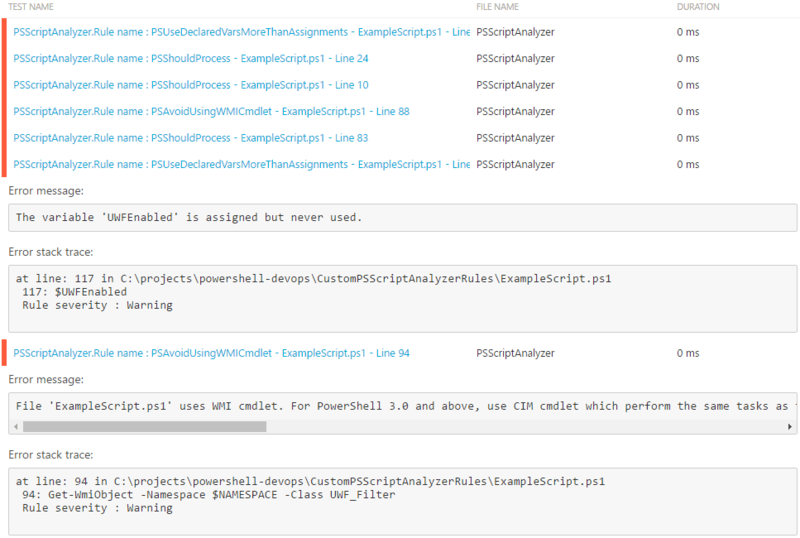 Since we are talking about a PowerShell pipeline, we are most likely already using Pester to test our PowerShell code. Pester can spit out results in the same XML format as NUnit and these NUnit XML files can be consumed and published by most CI tools. It makes a lot of sense to leverage this Pester integration as a universal CI glue and run our PSScriptAnalyzer checks as Pester tests. Let’s look at possible ways to do that. Here, we are checking all the rules which have a Warning severity within one single test. Then, we rely on the fact that if PSScriptAnalyzer returns something, it means that they were at least one violation and if PSScriptAnalyzer returns nothing, it’s all good. The Pester failure message gives us the object type of the PSScriptAnalyzer results, instead of their contents. This is a pretty typical (and better) way of running PSScriptAnalyzer checks via Pester. 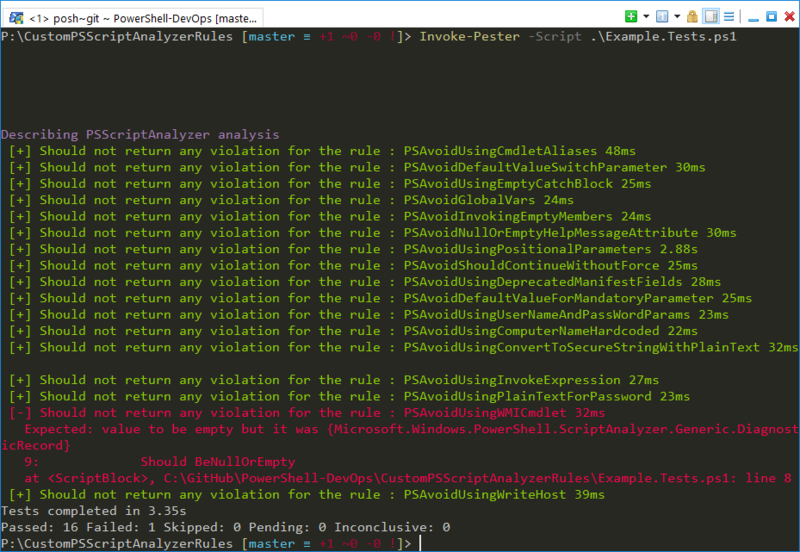 $ScriptAnalyzerRules = Get-ScriptAnalyzerRule -Name "PSAvoid*"
In this case, the first step is to get a list of the rules that we want to evaluate. Here, I changed the list of rules to : all rules which have a name starting with PSAvoid. This is just to show that we can filter the rules by name, as well as by severity. This is definitely better but we still encounter the same issue as before because there were more than one violation for that PSAvoidUsingWMICmdlet rule. So we still don’t get the file name and the line number. We could use a nested loop : for each rule, we would loop through each file. That would be more granular and reduce the risk of this particular issue. But if a single file violated the same rule more than once, we would still have the same problem. So, I decided to go take a different route to address this problem : taking the output from PSScriptAnalyzer and converting it to a test result file, using the same XML schema as Pester and NUnit. For that purpose, I wrote a function named Export-NUnitXml, which is available in this module. Just by reading the name of the test case, we get the essential information : the rule name, the file name and even the line number. Also, we can expand any failed test to get additional information. The “Stacktrace” section provides additional details, like the rule severity and the actual offending code. Another nice touch is that the “Error message” section gives us the rule message, which normally provides an actionable recommendation to remediate the problem. But, what if PSScriptAnalyzer returns nothing ? Export-NUnitXml does handle this scenario gracefully because its ScriptAnalyzerResult parameter accepts $Null. In this case, the test result file will contain only 1 test case and this test will pass. So now, we not only have quick feedback on our adherence to coding standards, but we also get actionable guidance on how to improve. I love this idea. Right now I have to comb through the stack trace to see what rules were broken. This is a much more elegant solution.